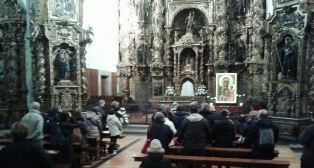 On the 28th of December, on the feast of Holy Innocents, at 11AM the Mother of God peregrinating in Her Częstochowa Icon arrived in Santiago de Compostella, the capital of Galicia, located on the Western part of the Cantabria Mountains. For centuries the town has been one of the most famous pilgrimage centres because of the tomb of St James the Elder, one of the 12 Apostles, the brother of St John the Evangelist. He is recognised as Saint Martyr by the Catholic, Orthodox, Armenian, Coptic, English and Evangelical churches. He was beheaded with a sword during the first persecution of Christians in Jerusalem around 44 BC. His remains were carried from Jerusalem to Santiago de Compostella in the 7th century due to the Arab invasion in the Holy Land. The Mother of God came to the old church of St Pelagius belonging to the convent of the Benedictine Sisters. The sisters welcomed the Icon of Our Lady of Częstochowa at the entrance. Having being carried inside, the Icon was placed in the presbitery and the faithful could pay homage to Her individually. On this day in the afternoon the organisers of the pilgrimage took part in a programme of Radio COPE, run by the Conference of the Spanish Episcopate. In the programme they talked about the aims and the story of the peregrination of the Icon “From Ocean to Ocean” which aroused big interest among the listeners. In the evening the Rosary was said in the church for the defence of life and family and the adoration lasted till 9 PM. The Benedictine Sisters invited the Mother of God for the night to their own place at the enclosure, and as Mother Superior Blanca said they kept vigil for the whole night. On the next day, the 29th of December, the morning prayers were started by the sisters who sang the Prayers of the Hours. Then the Holy Mass was celebrated and the preacher was speaking about the special connection between the Virgin Mary and the mothers carrying their conceived children under their hearts. He quoted the scene from the Gospel when the baby Jesus was dedicated to God in the temple. After saying the Rosary for the defence of life and family the Icon was carried in a procession through the main streets of the town to the famous square Quintana de Vivos, at the back of the cathedral, according to tradition built on the tomb of Saint James the Elder. Next the procession went to the Square of Mary the Immaculate (Immaculada), where the Life Mobile was waiting to take Our Lady to the town of Zamora in Castille.